''Sergeant York'' ''Sergeant York'' is an adventure war film telling the true story of the life of Alvin York, the most-decorated American soldier of World War I. The movie was made in 1941, directed by Howard Hawks and starred Gary Cooper, Walter Brennan, Joan Leslie and Margaret Wycherly. The movie was ranked 57th in the American Film Institute's list of most inspirational movies and the character of Alvin York was ranked at number 35 it the AFI's list of the top 50 heroes in American cinema. 'Sergeant York' was selected in 2008 for preservation in the United States National Film Registry by the Library of Congress. The movie won the Academy Award for Best Actor for Gary Cooper who became firmly established as one of Hollywood's top leading men and also won for Best Film Editing. It received nine further nominations which were unsuccessful, including Best Picture, Best Director, Best Supporting Actor for Walter Brennan, and Best Supporting Actress for Margaret Wycherly. 'Sergeant York' was both a critical and a box-office success and it became the biggest-grossing movie of 1941. Adjusted for inflation it remains one of the highest grossing films of all time. The movie tells the story of backwoods Tennessee farmer, Alvin York, who wrestled with his religious pacifism and eventually became the greatest hero of World War I. He personally kills 25 German soldiers, then single-handedly captures 132 prisoners, winning the Congressional Medal of Honor for his incredible courage. After Alvin York's ticker-tape parade through New York in 1919, York was requested for the film rights to his story by Jesse Lasky, head of the Famous Players-Lasky Corporation. At the time York refused and for many years refused to sell the rights, saying, "This uniform ain't for sale." However, during the 1930's, after Lasky had joined Warner Brothers, and as war in Europe became more likely, York agreed to participate providing that his profits would go to finance the creation of a Bible school and provided that only Gary Cooper could play him. Cooper, himself, wasn't eligible for military service due to an old hip injury, and at first was not keen on the role. He was also under contract to Sam Goldwyn, Lasky's former brother-in-law. Delicate negotiations took place and finally Cooper was swapped for Warner player, Betty Davis, who appeared in Goldwyn's 1941 film 'Little Foxes'. The film was given an initial budget of $1 million and a shooting schedule of 48 days. The actual shoot took longer and occurred between February and late April 1941. 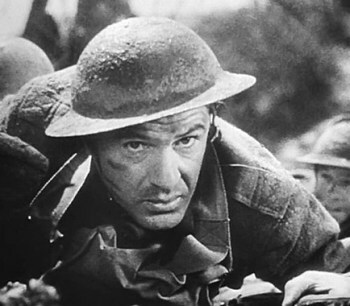 The original working title of the movie was 'The Amazing Life of Sergeant York'. Although Gary Cooper was a near certainty from the start for the lead role, Henry Fonda, James Stewart, Pat O'Brien and Ronald Reagan were also briefly considered. Numerous actresses were considered for the part of Gracie, including Linda Hayes, Helen Wood, Suzanne Carnahan and bizarrely, Jane Russell. Joan Leslie was 16, the same age as the real Gracie when she made the film. Alvin C. York had made it a prerequisite before agreeing to the movie, that he didn't want an actress who smoked or who had any sort of wild reputation to portray his wife. Production Company ... Warner Bros. Pictures, Inc.